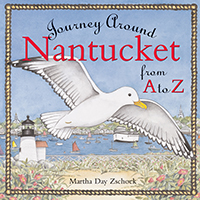 Martha Day Zschock, creator of the "Journey Around" series, turns her attention to another New England treasure, Nantucket. From the culture of the Wampanoag Indians who gave Nantucket its name (it means faraway land) to the early abolition of slavery (in 1773), through the heyday of whaling in the eighteenth and nineteenth centuries to the summer delights of the vacation mecca of today, Zschock traces the history of this special place with graceful turns of phrase and an unmatched artistry. 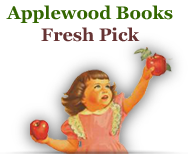 Like previous volumes in the series, this is much more than an alphabet book. 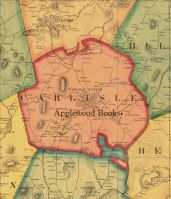 Each page is headed by an alliterative sentence that evokes an important theme of life on the island. The "C" page says, "Crimson cranberries carpet conservation acres."